Download FLAC to MP3 Mac Now! Convert FLAC Music On Mac. FLAC To MP3 Mac is a Mac OS software product that converts FLAC to MP3, WMA, M4A, AAC, OGG and WAV audio formats. Besides FLAC format, this FLAC To MP3 Converter can also convert other video and audio file formats to MP3 format. FLAC To MP3 Mac also transfers the tag information and meta data from FLAC into MP3, so users can keep all tags in the converted songs. The application has an easy-to-use UI and users can drag their FLAC files onto the program and drop them then the conversion would start immediately and convert all media files in bulk. FLAC (Free Lossless Audio Codec) compresses the original audio data (CD and WAV etc.) by the lossless data compression algorithm, so this format is becoming increasingly popular in the world because the FLAC audio files will not lose the original audio quality while playing, and will have a much smaller file size compared to CDA and WAV formats. There are many FLAC music sources now, so people can easily find and download FLAC songs from the internet to enjoy high quality music, or rip the CDA audio tracks from audio CDs to FLAC files directly. However, if you need to make the audio file size even smaller, or want to play your music on more devices, MP3 format would be a better choice. As the most popular audio format, MP3 is compatible with more and more software products and hardware devices. 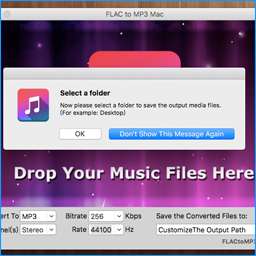 You can use FLAC to MP3 Mac to convert your FLAC audio files to MP3 format on Mac OS. After dragging and dropping your FLAC songs onto the application and choosing the output path, you will see the program start the conversion immediately. Within a few seconds the songs will be entirely converted to MP3 format and located in the folder you select. 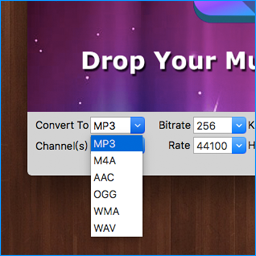 Besides MP3, FLAC to MP3 Mac allows users to convert FLAC songs to additional audio formats such as AAC, M4A, OGG, WMA and WAV. 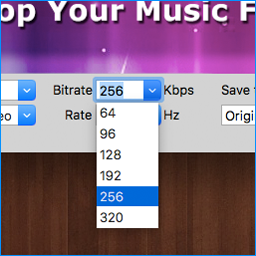 You can also use the FLAC to MP3 Mac to extract audio from video files like MP4, MOV and most popular video formats. The first option box on the application UI (user interface) is the output format. The MP3 format has been chosen by default. You can set the output MP3 audio bit rate, channel and rate on the UI. You will need to set these options before selecting your FLAC files. On the right hand side, you can see there is an option that enables you to set the output path. It has been set to save the converted files to "Original Folder", which means the converted MP3 files will be in the same folder as the FLAC files are in. You can change the setting to "Customize the Output Path" and then you can choose another folder path, for example Desktop or Document folder, to save the converted files. Now you've completed all the settings. Drag your FLAC files onto the application, or click on the large application image to add files, and the conversion will start immediately. 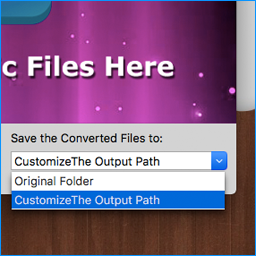 NOTE: If you have set the output path as "Customize the Output Path", the application will ask you for the new folder path before converting in this step. The application starts the conversion the instant you add the FLAC files. You will see the progress bar which tells you the progress of the current conversion and how many FLACs are in the queue preparing to be converted. Once the conversion is complete, you will be able to find the converted files in the location folder you have set or the default original folder. 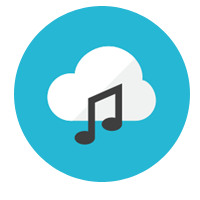 The procedures for converting other formats to MP3 are same as converting the FLAC to MP3 format. Just adding the files of other formats to the application in the same way you would add a FLAC file will work perfectly. If you add a video file, the program will extract the audio for you. 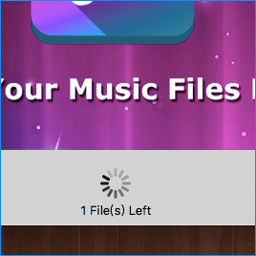 Simply Dragging & Dropping FLAC files onto the app would launch the conversion instantly. All 6 most popular audio formats in the world: MP3, AAC, M4A, OGG, WAV and WMA. FLAC to MP3 Mac could also convert other audio formats as input to MP3 like WAV, WMA, and AAC etc. The app can extract audio from all popular video formats like MP4, MOV, AVI, MPG, WMV, M4P (no DRM) etc. Drag & drop all your FLAC files to convert them at once. Copyright (c) FLACtoMP3Mac.com. All rights reserved.